Multi-Aspect Cam is a very simple camera app that concentrates on one thing: allowing you to take photos in different aspect ratios with your iPhone camera. 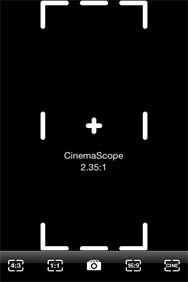 The regular iPhone camera takes photos with a 2:3 aspect ratio, but there may be times when you’d like to experiment with something different, like a super 2.35:1 CinemaScope view, as seen in movies, or a square 1:1 ratio like a medium format camera would produce. The Usual Aspects: Aspect options in Multi-Aspect Cam appear as a white outline in the viewfinder so that you can see what the aspect ratio of a shot will look like. Using Gravity Loves Time’s $1 app is extremely simple. As soon as you launch Multi-Aspect Cam, the app presents you with the aspects that you can select along the bottom bar, on either side of the camera shutter button. You can select one of these, or just swipe left or right to cycle through the various options. Each aspect option appears in a white outline on the viewfinder that makes up the rest of the screen. Like a wide-screen movie, black bars cover the parts of the viewfinder that are outside the chosen ratio. As soon as you tap the shutter button, the camera launches and the viewfinder becomes “live,” allowing you to frame and select the shot you want to take, while viewing through the cropped aspect you selected. If you’re using an iPhone 3GS, you can continue to tap the screen to focus as well, which is always handy. Once you take a photo, it’s saved automatically to your camera roll. Adding the ability to crop existing photos from your camera roll would extend the usefulness of the app. As it stands, with a wide variety of multifunction camera apps in the App Store, I’m not sure I need one that only does aspect ratio cropping. Still, Multi-Aspect Cam does a nice job of allowing you to take photos in different aspect ratios on your phone, and if all you’re looking for is something that does that, you’ll be pleased with the results.